CI (Comprehensible Input) is a teaching methods that focuses on the way our brains naturally acquire language. This happens when teachers intentionally employ a body of techniques and strategies using specific principles that prioritizes the delivery of understandable, personalized and relevant messages. 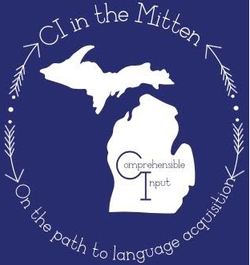 CI teachers generally adhere to Dr. Krashen's Comprehension Hypothesis that states that language acquisition occurs when we understand messages (Comprehensible Input, or, CI) in the target language (TL). The ability to speak is the result of language acquisition, not the cause. All humans who have acquired their first language can acquire a second language. To read more about how CI work with how our brains naturally acquire a second language and for a parent's thoughts on this process, please click the buttons below. Thank you to CiMidwest for the great explanation (borrowed with permission) of Comprehensible Input.